The ruffed lemur is the largest lemur, weighing 3.5 - 4.5 kg (7.7 - 10 lb). Its head and body length is about 50 cm (20"), and its tail is about 60 cm (24") long. Ruffed lemurs get their name from the long, thick hair on their ears. There are two subspecies: the black-and-white ruffed lemur and the red ruffed lemur. The two subspecies are generally similar but differ significantly in their coloration and where they are found. The pelages of both subspecies are long and luxuriant. The pelage of the black-and-white ruffed lemur (V.v. 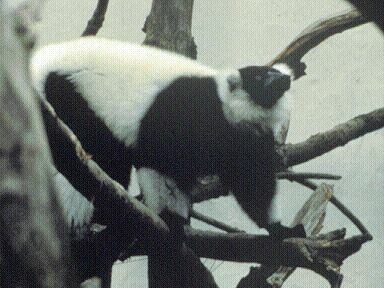 variegata) predominantly consists of different-sized patches of black and white, while that of the red ruffed lemur (V.v. rubra) is mostly red, with a black crown and a white nape. The ruffed lemur lives in primary and secondary rain forests in eastern Madagascar. The ruffed lemur is entirely vegetarian, eating mainly fruit with supplemental leaves, nectar and seeds. Fruit comprises a larger percentage of its diet than is the case for any other lemur. The ruffed lemur is an arboreal forest dweller. It prefers to spend time in the top layers of the canopy. Almost exclusively diurnal, the ruffed lemur is most active early in the morning and in the late afternoon and evening. A female ruffed lemur does not carry her offspring on her stomach or back like most primates. Rather, unlike any other primate in the world, a female ruffed lemur gives birth and leaves her young in a nest made from twigs, leaves and vines, generally 10 - 20 m (33 - 66') above the ground. The social structure of the ruffed lemur is variable - groups can include 1 male and 1 female, multiple males and females, or aggregations of smaller groups. In some areas of Madagascar, the animals are found in small groups of 2 - 5 individuals. In other areas, loose affiliations of between 18 and 32 animals occupy home ranges around 60 hectares (150 acres) in size. Females are the driving force in group dynamics and are always dominant over males. The social system changes depending on the season and the quality of the habitat. Ruffed lemurs will form larger groups during the wet season when food is plentiful, and disperse during the dry season in search of scarce fruit. Ruffed lemurs are confined to eastern rain forest regions of Madagascar and appear to be uncommon to rare throughout their range. The Antainambalana River in northeastern Madagascar separates the ranges of the two subspecies. 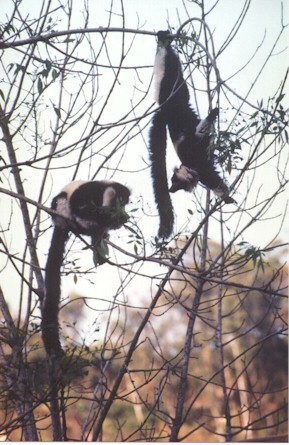 Black-and-white ruffed lemurs were originally found in most forested areas along the entire east coast of Madagascar. Currently, the distribution of the black-and-white subspecies is poorly known, particularly at the northern limits. 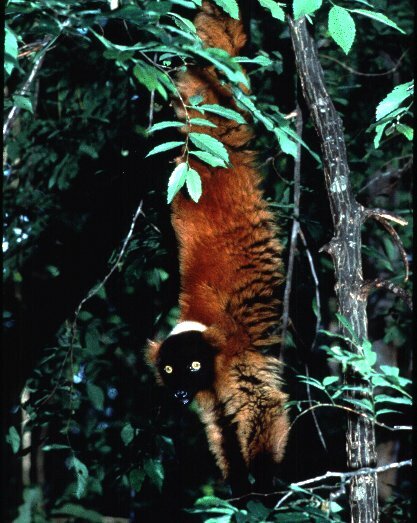 The red ruffed lemur appears to be restricted to the Masoala Peninsula in northeastern Madagascar. The ruffed lemur is threatened by deforestation and by hunting and trapping for food and the pet trade. *** Ruffed lemurs have an elaborate system of loud alarm barks that alert group members to danger from predators. All of the group members join in. Both subspecies of ruffed lemur can understand the alarm calls of the other and will often "join in" if they are close enough to hear each other. (Duke Univ. 1999, 2003a) . There are two subspecies of the ruffed lemur: the black-and-white ruffed lemur (Varecia variegata variegata), also known by the names vari, varikandana, and varikandra; and the red ruffed lemur (V. v. rubra (or ruber)), also known by the names varimena and varignena. 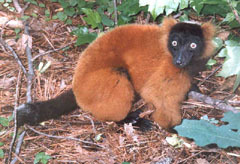 The two subspecies are generally similar but are different in coloration and are found in different (but adjacent) areas in Madagascar. The head and body length of the ruffed lemur is 50 - 55 cm (20 - 22"), and its tail is 60 - 65 cm (24 - 26") long. It weighs 3.5 - 4.5 kg (7.7 - 10 lb). The ruffed lemur is one of the species that live in the Madagascar & Indian Ocean Islands Biodiversity Hotspot (Cons. Intl. 2005) . Females can become pregnant at 20 months, but the average age at first reproduction in captivity is 3.4 years (Nowak 1999) . Twins appear to be the norm, but litter sizes of up to 6 have been reported in captivity (Garbutt 1999, Duke Univ. Prim. Ctr. 2004) . Although the interval between births can be one year, the findings of one study (Merenlender et al. 1998) support an earlier suggestion that the ruffed lemur successfully reproduces only once in two years in the wild. 15-20 years in the wild (Duke Univ. 2003a) . Several have lived in captivity for more than 25 years, and one was still living at about 33 years (Nowak 1999) . The ruffed lemur is entirely vegetarian, eating mainly fruit with supplemental leaves, nectar and seeds. Fruit comprises a larger percentage of its diet than is the case for any other lemur. The diet of the black-and-white ruffed lemur consists primarily of fruit and nectar, supplemented with small amounts of leaves and seeds. Nectar is only available for short periods each year but constitutes the dominant food source when flowers are in bloom. Approximately 75% of the red ruffed lemur's diet is fruit, with the remainder being made up of leaves, nectar and, to a lesser extent, flowers. A wide variety of plant species are utilized by the red ruffed lemur throughout the year (over 40 species have been recorded in its diet). The social structure of the ruffed lemur is variable - groups can include 1 male and 1 female, multiple males and females, or aggregations of smaller groups. In some areas of Madagascar, the animals are found in small groups of 2 - 5 individuals. All group members use a common core home range, and groups are occasionally aggressive towards other groups at the borders of these areas. These groups typically have a home range of 25 hectares (63 acres). In other areas, loose affiliations of between 18 and 32 animals occupy home ranges around 60 hectares (150 acres) in size. Females are the driving force in group dynamics and are always dominant over males (Female dominance in primates is unique to prosimians.). The social system changes depending on the season and the quality of the habitat. Ruffed lemurs will form larger groups during the wet season when food is plentiful, and disperse during the dry season in search of scarce, but much desired, fruit. There is a strong correlation between location of home ranges and location of the largest fruiting trees in the area. When foraging for fruit, large groups might fragment completely as individuals go their separate ways. This is in striking contrast to other diurnal lemurs, which always forage and move through the forest together as cohesive groups. Ruffed lemur populations have approximately the same number of adult females and adult males. Population densities of the red ruffed lemur in one study on the Masoala Peninsula ranged from 7 - 28 individuals/sq km (18 - 72 individuals/sq mi) (Merenlender et al. 1998) . Home ranges of the red ruffed lemur estimated in two studies on the Masoala Peninsula varied from 24 - 58 hectares (60 - 143 acres) (Merenlender et al. 1998) .